The Astrophysics Concentration is designed for those who intend to go on to graduate school in the physical sciences such as Astronomy, Physics, or Engineering. The General Astronomy Concentration is intended for students who do not plan on research careers in astronomy, but may have more broad intellectual interests, and are interested in related career paths, such as education or public outreach. The flexibility offered by the General Astronomy Concentration make it suitable to be elected as second major by broad group of students. To apply for a major in Astronomy, please contact the Astronomy DUS. For those pursuing an Astrophysics Concentration, ASTRO 4410 is required. In addition to these core requirements, each Astronomy Major must complete a Concentration in either Astrophysics or General Astronomy, which is an additional set of 9-10 courses concentrated in areas relevant to their future career goals. It is highly recommended that a student with an Astrophysics concentration have at least as semester or summer research experience under the guidance of a faculty member in the Astronomy Field. Course/Credit Count. The requirements for the Astronomy Major with an Astrophysics Concentration are therefore 16 courses totaling 66-67 credit hours. The General Astronomy Concentration is designed for students who may not plan on a research career in astronomy, but plan careers in related fields such as education, or public outreach. The flexibility offered by the General Astronomy Concentration make it suitable to be elected as second major by broad group of students. 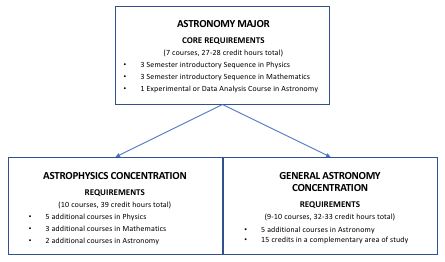 The General Astronomy Concentration requires five additional courses in Astronomy (17-18 credits total), plus an additional 15 credits in a complementary area of study (four to five courses) as explicated below. Other Astronomy courses with prior approval of the DUS. Fifteen Credit Hours in a Complementary Area. Complementary Areas can be selected from a wide variety of disciplines, but the courses selected must be cohesive, and complement the core requirements. For example, those interested in astrobiology might choose a Complementary Area of biological sciences, those interested in planetary science might choose Earth and Atmospheric Science, those interested in teaching at the high-school level might pick education, and those interested in public policy might choose Government, Economics, or Science and Technology Studies. It is up to the student, in consultation with their faculty advisor to design the Complementary Area. At least eight of the Complementary Area credits must be in courses numbered above 3000. Complementary Areas are normally mapped out by the end of their sophomore year. Course/Credit Count. The requirements for the Astronomy Major with a General Astronomy Concentration are therefore 16-17 courses (12 of which are in Astronomy, Physics and Mathematics) totaling 59-61 credit hours (44-46 of which are in Astronomy, Physics, and Mathematics). It is expected that some majors, especially those with General Astronomy Concentrations will have double majors, either totally distinct from Astronomy, or ones that include courses from their Complementary Area. In these cases, their Complementary Area credits can be counted for both majors as allowed by the second major. For example, students may double major in Astronomy and Mathematics with the Astronomy Core MATH courses counted towards both majors. However, it is not allowed to double major in Astronomy with an Astrophysics Concentration, and Physics due to extensive overlap of requirements. Non-Astronomy majors from all Cornell colleges are eligible to earn an Astronomy Minor. The Astronomy Minor is designed to demonstrate a level of interest and competence in astronomy and data science that is appropriate for pursuit of a wide variety of careers. To apply for an Astronomy Minor make an appointment to visit the Director of Undergraduate studies (astronomydus@astro.cornell.edu). The Astronomy Minor requires completion of a total of 13 credit hours in Astronomy at or above the 2000 level. At least 6 of these credits must be at or above the 3000 level, and at least 6 of the 13 credits must have a letter grade. Independent study (ASTRO 4490) can qualify for the minor with approval by the Astronomy DUS. College of Arts and Sciences students enjoy an Ivy League education distinguished by unusual breadth and depth of study and freedom to shape their own curriculum. Each year, more than 25 percent of our students work closely with faculty in research and independent study. The college's departments and programs demonstrate the highest levels of scholarly and artistic achievement— half of the departments are among the nation's top 10 in their fields. The Courses of Study catalogs Cornell University’s diverse academic programs and resources. Full calendar through 2016 - 2020. Opportunity and Affordability. Our goal is to make applying for financial aid as simple as possible. Depending on when you apply or are admitted to Cornell, the requirements and deadlines vary.